The 11N Series is so old it has whiskers – its first manifestation was on August 1, 1125 (OS) at 14Leo33; it last occurred Jan 15, 1991 at ’26Cap’ which is conjunct US natal Pluto, so we may expect some of the same ‘use of power’ issues to resurface from 1991. The Eclipse of Jan 15, 1991 marked America’s ‘Desert Storm’ operation against Saddam Hussein’s invasion of Kuwait…all about oil, of course. The Iraqis left Kuwati oil fields aflame, as I remember. Yes, Bush41’s ‘Desert Storm’ was a storm, all right, and was on tv with impressive greenish night-goggliness. It was my first realization that the Middle East had a habit of burning rubber tires in great piles which I thought was very short-sighted of them on behalf of their and their children’s lungs. And 1991 was the year that Pan Am Airlines closed down due to mega-debts, an all-too-familiar theme already, plus, the USSR ceased to exist. Oliver Stone had his ‘JFK’ film premiere in 1991, and this year it’s ‘W” about you-know-who. So what about the ‘New President’ Solar Eclipse which occurs barely 6 days after the (hopefully) new president takes over the Oval Office? This is an Hour of Mars with activist Mars 22Cap48 in 2nd house of Income; 2nd cusp is 3Cap34 (which places US natal Venus on 8th cusp of Shared Resources and Debt) so Mars, Mercury, Jupiter in AQ, Sun/Moon, and North Node 9AQ16 are actually quite far into 2nd house although the chart makes it seem as if Mars is near the cusp…there are actually 19 degrees between them. Only Pluto 2Cap08 is in 1st house, but is conj 2nd cusp and being in Capricorn, may as well be in 2nd house, too. You know that a Capricorn Pluto transforms business models, governmental, political, and justice systems so we may expect a continuation of what’s gone on the last several years with our nation’s justice system and courts, Constitution, and other things we hold dear on the chopping block, Dem prez or Repub. Bush fairly privatized our government – thanks for nuthin’. And the ‘Bailout Bill’ has a lot of reforming to do. Perhaps the recent and final debate between Obama and McCain may have told the tale – shall we have a scalpel (Obama) or a hatchet (McCain) used upon our nation’s social fabric and institutions? Of course, Capricorn is America’s natal sign of Pluto from 1776. Well, at least the 11N Series is considered ‘gentle’, right? And it certainly describes what happens when a president and family move into the White House. Of course, what pops out at us about this chart is the ongoing Saturn-Uranus opposition at Mc-Ic, thus Angular (4/10 axis of Career; Public Status; Aspirations), and considering the many associations of the Saturn-Uranus pair – tension; coping ability; the power to pull through and endure (oh yes we can! ); will-power; indefatigability; obstinacy; violent people; quarrels; separations; the limitation of freedom, etc (Ebertin) – as well as representing the Middle East, esp Israel and Palestine (Robert Blaschke), we see a bunch of difficulties awaiting ‘the annointed’ on the fabled “Day One”, Two, Three, Four, Five, and Six+. 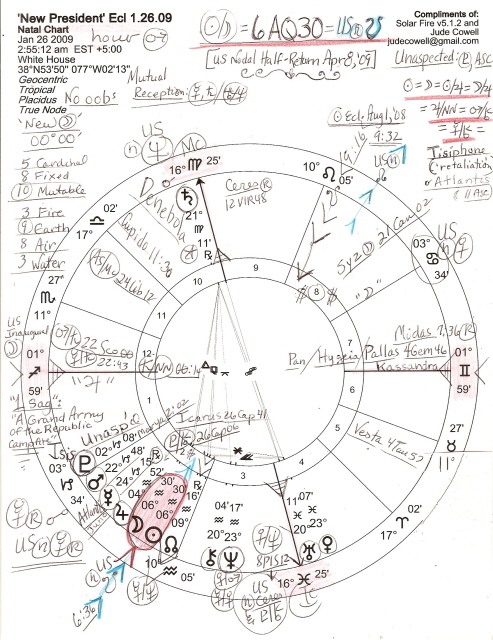 If you click to enlarge the chart, you see I’ve made a note at its top of the Eclipse degree being conjunct US natal South Node, and the fact that April 8, 2009 is the approximate date of America’s Nodal Half-Return. Uranus and Neptune continue their helpful-to-one-another mutual reception; the Eclipse occurs with Mercury and Saturn in mutual reception, too. Serious (Saturn) thinking and meetings (Mercury) are on the agenda, as we expect. Sun = Moon = Sun/Jupiter = Moon/Jupiter = Jupiter/NN = Mars/Chiron = Mercury/Chiron. The midpoints seem to indicate lots of happy feelings of success, with Jupiter/NN pointing toward the meaning of the 10N Eclipse Series (see above)…Mars/Chiron is the ‘sacred warrior achetype’ (Clow), and Mercury/Chiron could be ‘healing words or wounding words’ – perhaps alternating. Chart-ruler Jupiter 4AQ52 may be a protecting force so near the Eclipse degree as he is in the Inauguration 2009 chart for Sun and Mercury, but here Mr. Moneybags-Guru-and usually a Republican – makes only two minor applying aspects in the Eclipse chart: a semi-square with Uranus (0A19) and a dynamic sesquisquare with Saturn (1A19.) His next hook-up is a conjunction with North Node in mid-February. And Jupiter also will conj this Eclipse degree (and US n SN degree) in early February 2009, which can indicate loss of money and/or loss of a Republican, preacher, professor, or another Jupiterian figure. One more thing is the exalted-in-Pisces Venus, spilled out of the bowl, as *John Townley has called the Saturn-Uranus opposition with planets on one side of the chart…here you see the lovely Piscean Venus spilled out in 4th house of Domestic Scene. That America’s middle class needs a boost by the new president is obvious, and spiritualized Venus in Pisces would appreciate any help she can get, esp after being under attack these last several years. More renegotiating of mortgages to keep people in their homes would be a nice way to begin an administration, whether Democrat or Republican – if they truly want to keep this nation from splintering apart (Saturn-Uranus) and going third-world. But sad to say, I’m not convinced that they do because a complete overhaul (Pluto in Cap) along totalitarian lines seems to be their aim….”they” being the ruling elite, the target being the rest of us…it’s Pluto/Chiron’s plutocracy and oppression taking charge. It’s ughy to keep saying it, but we must remain aware. Besides, when it comes to representing Jill and Joe Six-Pack, there’s little if any difference between either of the parties which are chocked full of members who only long to stay in their catbird seats, with the little guy the bird. They like us only when it’s an election year, you may have noticed. Well, you must be as wumped out by this chart info as I am – my lone typing finger is getting knarled up – so I’ll mosey for now. If you know what I’ve neglected to mention (and there’s a lot) please leave your comments. NASA tells about times, totality, and paths of visibility for upcoming Eclipses of 2009.
nice site but i was wondering about the eclipse. where can it be viewed from. its on JAnuary 26 2009 and all and u tell all info but where can it be viewed from. I live in illinois and i always wanted to see one but i never have. just e-mail me back. THANKS…EMMA <3z u! !